Jupyter Server Proxy automatically adds entries for registered Server Processes in both the classic Jupyter Notebook interface and the JupyterLab Launcher. 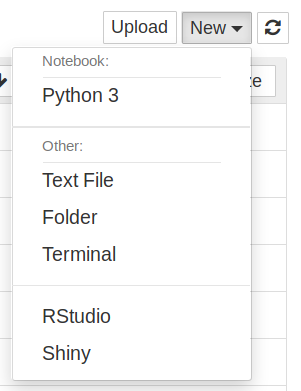 By default, an entry is made for each server process under the ‘New’ menu in the notebook’s default tree view. Note that a new instance is not launched every time you click an item - if the process is already running, it is reused. The jupyterlab-server-proxy JupyterLab extension can be installed to provide launcher icons for registered server processes. Clicking on them will open the application in a new window.